A dozen humorous poems are inspired by Christmas-related words or phrases as a child might mishear them. 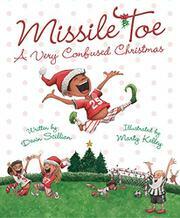 The cover and related title poem, “Missile Toe,” focus on a soccer player by that name. He is a boy with brown skin who always leaps too high and misses scoring. This time, he still leaps but gently taps the ball in as the other players “hugged and kissed beneath Missile Toe.” Most of the other poems focus on traditional Christmas songs, with some sort of humorous twist on the title or a line from the song as the poem’s theme, as in the poems “O Holey Knight” and “The Wee Kings of Orientar.” The poem “Deck the Halls” riffs on a phrase that many a child has found mysterious. There is no title page or author’s note to identify the original songs. Most of the poems require a level of background knowledge that is beyond the capacity of the intended audience, and the humor would need to be explained to children. A few poems stand on their own, such as “Johnny Oats Ate Nicholas,” about a puppy named Johnny Oats who eats Nicholas the guppy (though it may take saying the title a few times to understand the sonic confusion), and “I’ll Be a Gnome for Christmas.” Amusing, action-filled illustrations include children of different ethnicities. Santa is white; the Wise Men have brown skin. WHERE DID THEY HIDE MY PRESENTS?